have you attempted to use 1.7? and copy the correct files? Yes, I am using JConfig v1.7. According to "DariusBurst.rar" and Readme in the archive, I think that it is set correctly. I am using the x360 controller in Jconfig Dinput Mode, but I can not operate it in H ZONE. There is also a problem that the key is constantly entered downward. Other than that, when the start button does not respond or when the guide button is pressed, credits are inserted at the speed of light. Make sure you have copied DSOUND.DLL this can cause theese problems. Enter devreorder.ini paste the name under the hidden section only the name, in my case it looks like this. ; in the order you want them to be detected, one per line. ; enclosed in curly braces, just like in DeviceLister.exe. ; same format as above. Now the Mayflash adapter cant interfere with the game. I tried the following things. Start button does not respond when Jconfig is in "Dinput" mode. Start button does not respond when Jconfig is in "Xinput" mode. If you set Jconfig to "DInput & XInput" mode, you can not set keys for X360 pad in JConfig. I tried Devreorder.rar, but it was the same as above. Next I pulled out all Dinput devices. However, the start button of the X360 controller does not respond. In rare cases, the start button responds, but does not respond when you want to continue. You can enter the test mode, but the key that is not touched in the input test is responding. I think that there is a problem with my head or PC, I decided to give up. Did you copy Dsound.dll from Darius Burst within Jconfig? If you can add the support initially within your loader I will happily test it with all the games for Jconfig, that isnt supported atm. The settings in init.ini have not been changed at all. Re-installing the OS is a hassle, but there will be a large update of Windows 10 in the near future, so we will try again at that time. I will make you a tutorial how to do it and lets see if that works including how to hide devices. If you could, it would be awesome if you would add Initial Jconfig support to current games that have both Jconfig and TP support, as I stated I will also test all games for you, since you seem to have issues :(. As you can see, before using the reorder the coin input works but not the start input, it will auto press start every once and then for all 4 users creating issues ingame if enough coins are inserted. Alot of weird input issues is related to this. Can you please tell us the differences between the normal version of Dariusburst and the version unlock A and Unlock B ? Did the unlock B version is the most complete and recent one? Level differences inorder to change the game when the game is loosing players. So the unlock B is the last updated version? This is a problem with my PC. I'm removing all DInput devices. Untouched keys react and are out of control. And even if you move the mouse, the keys that are not touched will respond. I gave up, so no reply is necessary. For the US/EU version, Unlock A & B were included with the shipped game, unlocked through a password code provided by Taito. Thank you for the save. But, what are the 2 passwords for test mode please ? Finally I managed to run this game correctly with jconfig: no reverse screen, sound working, english language, controls working and unlock A - B.
I want to share my game folder. 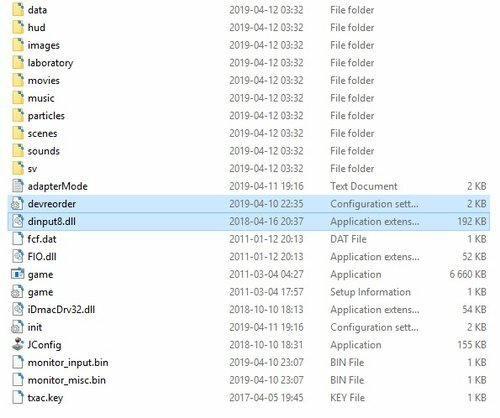 You should only extract this file in the GameFiles folder and overwrite all the files. The controls are the keyboard but you can change it in the jconfig menu. 1. When I turn on JVS, all my buttons can be used, but the second screen is reversed. 2. When I turn off JVS, I only have 1 to 4P START button to use, but the screen is normal. So, how can I make this game work? From Emuline THANK YOU ! Work for me ! Screen 2 is no flipped and no credits bug. Question, que doit t'on faire du dossier SystemFile dans DariusBurst.rar ?